Directorate of Education, Delhi Govt. invites online applications for engagement of guest teachers for the posts of Asstt. 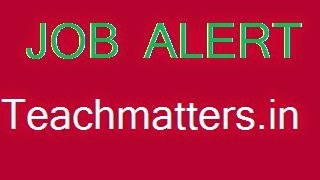 Teacher (Primary/Nursery), TGT & PGT/Lecturer in Delhi Government Schools for the year 2014-15. 1. PGT/Lecturer : Post Graduate degree in the subject concerned, with B. Ed. 2. TGT : Graduate degree in the subject concerned, with B. Ed. 2. Pass in the Central Teacher Eligibility Test (CTET) (Paper-I - Primary Level) conducted by the Central Board of Secondary Education (CBSE). 3. Must have passed Hindi or Urdu or Punjabi or English as a subject at Secondary level. (ii) Diploma/certificate in Nursery Teacher Education of not less than 2 years or B. Ed. (Nursery) from recognized Institute. 1. Guest Teachers shall be engaged purely on adhoc and daily basis till the posts are filled up on regular basis. Guest Teachers shall not be entitled to regular appointment. This is purely a stop gap arrangement. The candidates so engaged shall not claim salary, allowances, facilities and other benefits accruing to the regular teachers The candidates so engaged as Guest Teachers shall not file any court case regarding salary and regularization etc. 3. Reservations and age relaxations to candidates belonging to SC/ST/OBC and Disabled persons will be given as per Govt. orders. The certificate of OBC should be issued by authority of Govt of NCT Delhi. For SC/ST candidates certificate issued by any state/u'r will be considered. The candidates belonging to Physically Handicapped category (Ortho + VH only) must posses "Disability Certificate' issued from a Government Hospital. 07.08.2014 (upto 6 PM). Submission of applications other than online shall not be entertained and any deviation in this regard shall lead to summary rejection. Applicants are strictly instructed not to send any hard copy of the application to this department. 5. Post based district-wise order of merit list will be prepared on the basis of academic merit separately for each category of applicants namely SC/ST/OBC/Disabled persons and others. any time during the engagement. If the person does not join within given time, the offer of appointment will be cancelled. 7. The Guest Teachers will be dis-engaged from the school as soon as a regular teacher joins the school and the Guest Teachers working in that particular school will be disengaged irrespective of his/ her standing in the order of merit list initially drawn district-wise for the purpose of engagement. 8. Guest Teachers engaged on online during 2013-14 will be given preference mark in the engagement of Guest Teachers during 2014-15. 9. Candidates applying for TGTs and Assistant Teachers (Primary) post are informed that following order of priority will be followed in the engagement process. 9.2 If vacancies remain un-filled then candidate qualified in Teaching Eligibility Test (TET) conducted by other states will be considered (List II). 9.3 If vacancies still remain unfilled candidates without CTET/TET will be considered (List III). However, this condition does not apply for Librarian/Home Science, Music, Drawing, Physical Education Teacher, Computer Science Teacher and Assistant Teacher (Nursery) post. 10. The order of merit list will be displayed on website on 12.08.2014 (6 p.rn) and the schedule for verification of documents relating to age, qualifications, caste certificate etc. at the respective district offices will be notified in due course of time on the web portal of this directorate. 11. The engagement of Guest Teachers for the current academic session i.e. 2014-15 will be up to 08/05/2015 or the commencement of the summer vacation whichever is earlier.